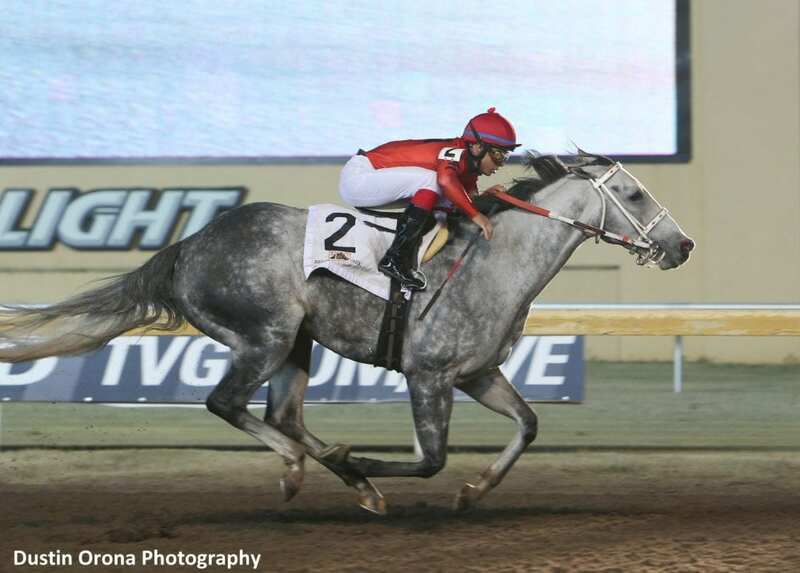 The 5-year-old gray gelding known as Welder streaked down the stretch to take his fourth stakes victory of the meet Friday night in the $70,000 Silver Goblin Stakes at Remington Park. Welder covered the 6-1/2 furlongs in 1:15.61 over a fast track, just a few ticks off the stakes record of 1:15 set by Zee Oh Six in the first running of the Silver Goblin in 2005. Welder paid $2.10 to win and the $2 exacta payout with Shannon C was $3.40. This was the second year in a row for Welder to visit the winner's circle in this stakes race. He joins Okie Ride, Johnny Whip and Steal Your Face as multiple winners in the Silver Goblin. Okie Ride won it three times in 2012, 2013 and 2016. The others won the race twice each, just like Welder. Welder, named for owner Rash's international welding business, is a bit of a miracle horse for these connections. Luneack only started training racehorses in 2013, but she has always had an eye for horse flesh and went to Mighty Acres Farms in Pryor, Okla., when Welder was a yearling. Rash had picked out four or five horses to pay $6,400 apiece for when Luneack saw a young gray standing in the corner of his stall and asked if they'd throw him in to the package for another $6,400. The rest is history. He earned $42,000 tonight and now has won seven of his last nine starts, six of them in stakes-company. His lifetime record is 15 wins from 23 starts for a bankroll of $635,151. Welder's resume this meet includes wins in the $70,000 Remington Park Turf Sprint that was taken off the turf on a wet night here on Sept. 7; the $150,000 David M. Vance Stakes on Oklahoma Derby Day, Sept. 30; and the $130,000 Oklahoma Classics Sprint on Oct. 19. One of the most amazing addendums to Welder's story is that he is vanned to Remington Park in Oklahoma City, from Claremore, Okla., every time he runs here. That's a trip of about 135 miles one way. “He gets really nervous on the van, too,” said Luneack. “He is not a good shipper. We usually start at 6 o'clock in the morning, getting ready. We have to leave for Remington by 2:30 or so because we have vet check at 5 p.m.” The Silver Goblin Stakes field left the gate at 9:52 p.m.
Luneack said Welder would get a rest and then likely make his next start at Oaklawn Park in Hot Springs, Ark. in 2019. That track's schedule shows the $100,000 King Cotton Stakes on Feb. 9 as the first sprint for older male horses. No need to bring fireworks. Welder provides his own. This entry was posted in Racing and tagged clayton rash, david cabrera, remington, remington park, silver goblin stakes, teri luneack, the visualizer, tiznow, welder by Press Release. Bookmark the permalink.